EDITOR’S NOTE: Updated after SpaceX scrubbed Wednesday’s launch attempt. A little more than a year after the Falcon Heavy rocket’s first test flight, SpaceX teams on Florida’s Space Coast are readying the world’s most powerful operational launcher for its second mission Thursday with a commercial communications satellite. The massive kerosene-fueled rocket, standing 229 feet (70 meters) tall and measuring nearly 40 feet (12.2 meters) in width, is scheduled for liftoff during a nearly two-hour launch window opening at 6:35 p.m. EDT (2235 GMT). SpaceX scrubbed a countdown Wednesday due to unfavorable winds aloft. Like last year’s inaugural flight, the Falcon Heavy’s two side boosters will return to Cape Canaveral, targeting nearly simultaneous touchdowns on SpaceX’s concrete landing pads on the Atlantic shoreline. Spectators stepping outside to watch Thursday’s launch and landings will hear a rumble from the Falcon Heavy’s 27 Merlin main engines generating more than 5 million pounds of thrust to propel the rocket skyward. Minutes later, the Falcon Heavy’s two side boosters will jettison and briefly reignite their engines to head back toward Florida. Back-to-back double sonic booms will herald the boosters’ arrival back at Cape Canaveral around eight minutes after liftoff. Thursday’s launch will be the second flight of SpaceX’s heavy-lifter, which engineers devised by connecting three modified Falcon 9 first stage boosters together. The Falcon Heavy’s debut flight on Feb. 6, 2018, tested the world’s most powerful rocket by hurling a Tesla sports car — with a spacesuit-clad mannequin in the driver’s seat — away from planet Earth and into orbit around the sun. The test flight last year was a spectacularly stylish display, and an out-of-this-world cross-branding opportunity for billionaire entrepreneur Elon Musk, the founder of SpaceX and Tesla. 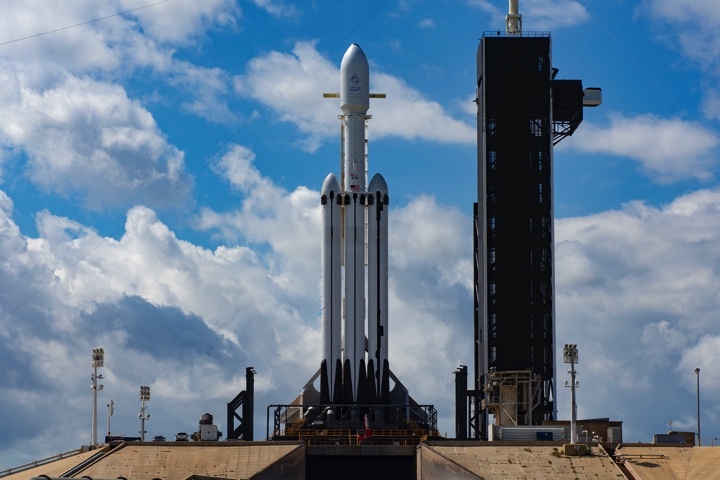 It also proved the Falcon Heavy’s capabilities for the U.S. Air Force, which certified the new rocket to launch national security satellites. 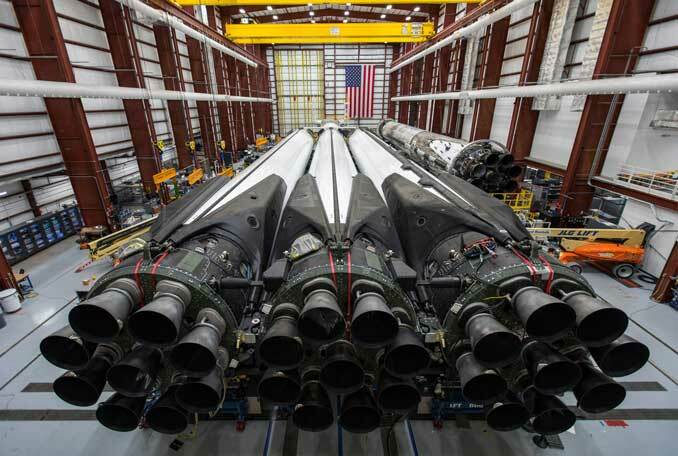 The rocket set for launch Thursday will be slightly different than the Falcon Heavy that flew last year. Using SpaceX’s new “Block 5” rocket stages, the second Falcon Heavy will generate up to 5.1 million pounds of thrust with its three boosters at full throttle. That’s nearly 10 percent more thrust than the first Falcon Heavy produced last year, using an older first stage design that is now retired, according to Musk. The Falcon Heavy’s engines put out more thrust at liftoff than any rocket since the space shuttle. Besides the increased thrust level, the Block 5 boosters have a beefed-up heat shield to better protect its engines and landing legs during re-entry back into the atmosphere. It also has sturdier titanium grid fins to replace aluminum steering winglets used on older Falcon boosters. The first Block 5 first stage flew last May on a Falcon 9 launch with the Bangabandhu 1 communications satellite. Block 5 boosters have flown 13 times to date — all successfully — including on the March 2 launch of SpaceX’s first Crew Dragon test flight to the International Space Station. The Block 5 booster will launch astronauts on the next Crew Dragon flight to the station later this year. But the Falcon Heavy’s flight Thursday marks the first launch with three of the new boosters firing in unison. “This is first launch of Falcon Heavy Block 5, so we’re being extra cautious,” Musk tweeted. The three boosters will ignite in the final seconds of Thursday’s countdown, and hold-down clamps will release to free the Falcon Heavy to climb away from pad 39A. 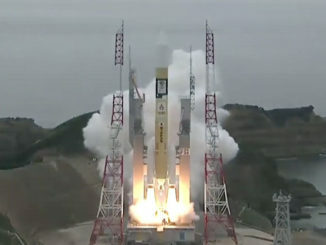 The center core will throttle down its engines to conserve propellant during the first two-and-a-half minutes of the flight. The two side boosters will jettison at T+plus 2 minutes, 34 seconds, and flip around to fly tail first with the help of cold gas nitrogen thrusters. The nine Merlin engines on Falcon Heavy’s core stage will throttle up to burn for another minute, while the side boosters will reignite three engines each to slow down their downrange velocity and begin accelerating back toward Cape Canaveral. The core stage will switch off its engines at T+plus 3 minutes, 31 seconds, and target a touchdown on SpaceX’s drone ship “Of Course I Still Love You” in the Atlantic Ocean hundreds of miles east of Florida’s coastline. A single Merlin upper stage engine will power up for the first of two burns required to inject the school bus-size Arabsat 6A spacecraft into a highly elliptical transfer orbit stretching nearly a quarter of the way to the moon. After two more braking burns, the side boosters will touch down at Landing Zone 1 and Landing Zone 2 at approximately T+plus 7 minutes, 51 seconds. The core stage will encounter hotter temperatures than the side boosters as it heads toward landing at sea around T+plus 9 minutes, 48 seconds. During last year’s Falcon Heavy test flight, the side boosters both returned safely to Cape Canaveral, but the core stage crashed in the Atlantic just off the deck of the drone ship after it ran out of igniter fluid. Both side boosters recovered after last year’s Falcon Heavy test launch were retired from service. 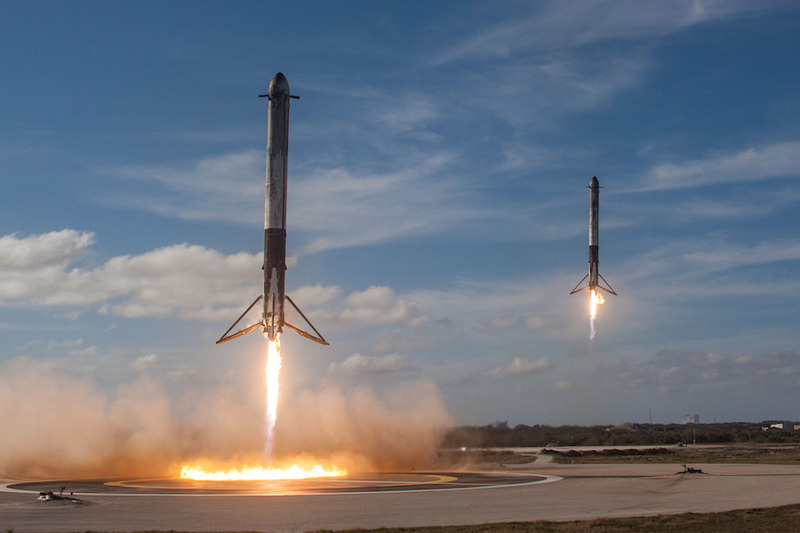 But this time, SpaceX is counting on a good recovery of the twin stages, which are fitted with aerodynamic nose cones, because they are slated to be reused on the next Falcon Heavy launch this summer. The U.S. Air Force plans to launch a couple dozen small research satellites on the third Falcon Heavy flight. 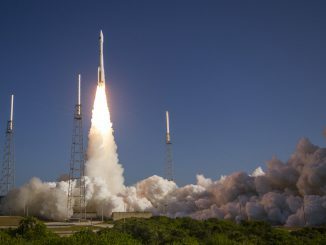 The mission, designated STP-2, or Space Test Program-2, will give the Air Force an opportunity to evaluate how SpaceX refurbishes its recovered rocket stages, helping the military move closer to certifying previously-flown hardware for future launches with critical and costly national security satellites. 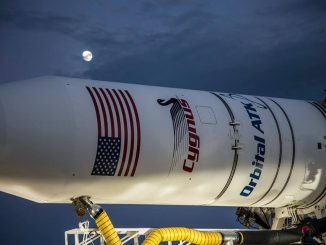 Despite the adoption of SpaceX’s reused rockets by commercial satellite operators and NASA, the Air Force has not yet flown one of its missions with a Falcon rocket recovered from a previous mission. While the dazzling display of three 15-story rockets returning to Earth will gain attention, the primary purpose of Thursday’s mission is to place the Arabsat 6A communications satellite into orbit. The second stage’s Merlin engine will shut down at T+plus 8 minutes, 48 seconds, and head across the Atlantic Ocean before a restart over Africa at T+plus 27 minutes, 34 seconds. The Falcon Heavy will aim for a “super-synchronous” transfer orbit ranging between 124 miles (200 kilometers) and nearly 56,000 miles (90,000 kilometers) above Earth, with an inclination of 23 degrees to the equator. Deployment of the Arabsat 6A satellite is expected around 34 minutes after liftoff. The spacecraft, built by Lockheed Martin, will soon contact ground controllers and unfurl its two solar array wings, which are based on a light-weight design that unrolls like a fabric, instead of the accordion-like design used by most satellites. 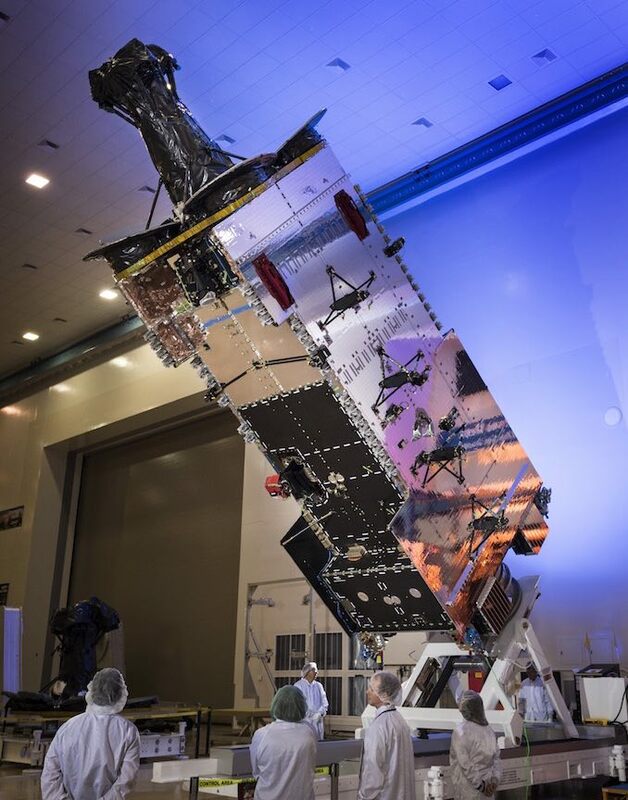 A Lockheed Martin spokesperson said the satellite weighs 14,252 pounds (6,465 kilograms) at launch, with its tanks fully loaded with hydrazine and nitrogen tetroxide maneuvering propellants. Arabsat 6A will use its own thruster to guide the satellite into a circular geostationary orbit more than 22,000 miles (nearly 36,000 kilometers) over the equator, the perfect altitude to allow its velocity to match the rate of Earth’s rotation. SpaceX’s Falcon 9 could have launched the Arabsat 6A satellite into a lower transfer orbit, but Arabsat booked a Falcon Heavy flight in 2015, before SpaceX introduced new Falcon 9 models that expanded its lift capability. With the extra energy of the Falcon Heavy, the Arabsat 6A satellite will be deployed in a much higher orbit, reducing the time the spacecraft needs to consume to maneuver into its final operating position. Falcon 9 rockets launched a pair of Telstar communications satellites, both heavier than Arabsat 6A, last year, but those spacecraft were released into lower, less ideal “sub-synchronous” transfer orbits.